As a developer of an educational application for mobile devices, I often find myself wondering how parents are adapting to the new paradigm presented by mobile gaming. There has always been a debate of good screen time versus bad screen time, but as more technology is being adapted into the home that debate has shifted. Screen time is inevitable, so parents are learning to make the most of it. At Galxyz, we wanted to know how parents are regulating their kids' screen time, so we partnered with Harris Poll to find out. It is important to the team at Galxyz and I to get these unbiased answers about what we believed to be true; from homes across a wider spectrum. Rather than just living in the Silicon Valley bubble we wanted to see how parents from all walks of life, geographies and backgrounds are being influenced by the increase of technology at home. Most importantly, how were they handling it with their children? We also wanted tangible evidence that parents do think that educational games qualify as good screen time. We also want to be able to show parents that they are not alone in how they feel about good versus bad screen time -- that this is a discussion happening in homes across the nation and around the world. So we tailored the survey to hone in on those two points -- technology as a babysitter and good versus bad screen time. As a parent balancing screen time with my own kids, I'm happy to reveal the results of this survey. The big surprise was mobile devices as a babysitter. The survey showed that parents don't feel very guilty about using mobile devices as a babysitter! 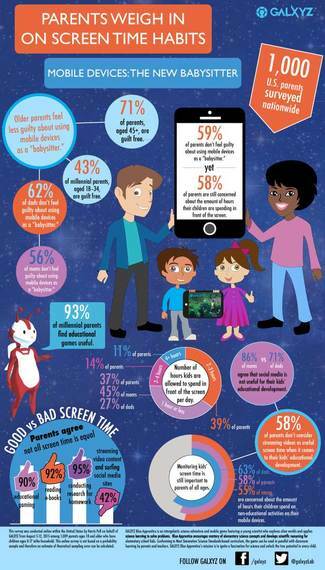 So the question then becomes - what does concern these parents when it comes to screen time? Turns out that these parents are concerned that the amount of time they are letting their children spend in front of the screen is too much. When parents were given the option to choose the categories they considered to be good screen time, they were overwhelmingly in favor of educational gaming (90%), reading e-books (92%) and research for homework (95%). Not surprisingly, streaming videos and playing on social media were ranked very low in the eyes of parent. In a sense, good screen time could be considered productive screen time. With the rise of educational apps and games, there are more options than ever before for parents to make screen time both fun and educational for their children. These apps are also making their way into the classroom, giving parents even more reason to absolve themselves of screen time guilt. Many parents have different views of how long is too long in front of a screen -- no matter the value. Almost 40 percent of survey respondents allow their kids two to three hours of screen time per day, while 37 percent stick to an hour or less. It can be hard to find a balance, especially if the majority of that screen time is good screen time. Parents also were solidly against social media counting as good screen time, with 86 percent of moms and 71 percent of dads agreeing that social media is not helpful in their children's development. Clearly parents agree that their children are best served by educational applications on mobile devices, rather than time wasters and entertainment applications. As parents, it is important for us to instill the proper lessons and restraint in our children when it comes to mobile devices and screen time. We must work to teach them the value of educational applications, and how just because it is on a screen doesn't mean it will do anything but waste their time. Bad screen time versus good screen time is not a debate that is going to end soon, but the options for good screen time are becoming more plentiful and valuable every day. The best thing we can do as parents is present our children with the best options for their educational success. For more on the Harris Poll / Galxyz survey, please visit here. Osman Rashid is an edtech leader, and the Founder & CEO of Galxyz, an intergalactic adventure that makes kids excited about science. Galxyz's mission is to ignite the fascination of science and unlock the true potential in every student. Previously, Osman was the Co-Founder and CEO of Chegg, the student hub and online textbook rental leader (NYSE:CHGG) until early 2010, and also Co-Founder and CEO of Kno, Inc. (acquired by Intel in 2013), a digital education platform company.